Being "different" is never easy. Having savant syndrome and not being "understood", must be even worse. 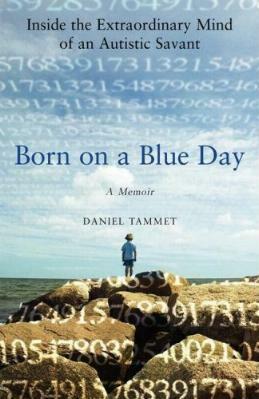 Daniel Tammet, the Englishman who sees numbers as shapes, colors, and textures, has savant syndrome. However, he's emerged an independent man living in his own place and he has his own business. I knew I would struggle with this book: one, because I know diddly about maths, and two, I don't "see" numbers in my head. At all. Daniel on the other hand, says, "I see 37's fifth power - 37 x 37 x 37 x 37 x 37 = 69,343,957 - as a large circle composed of smaller circles running clockwise from the top around". He visualizes the answers using his synesthetic shapes. I won't even pretend to know what he's talking about. Take this paragraph for example: "There are moments, as I 'm falling into sleep at night, that my mind fills suddenly with bright light and all I can see are numbers - hundreds, thousands of them - swimming rapidly over my eyes. The experience is beautiful and soothing to me. Some nights, when I'm having difficulty falling asleep, I imagine myself walking around my numerical landscapes. Then I feel safe and happy. I never feel lost, because the prime number shapes act as signposts." Having had loving and patient parents helped enormously. He was never forced to do anything and was allowed to explore his own quiet world. At a young age he had left temporal lobe seizures which may or may not have something to do with his extraordinary abilities. Daniel has Asperger's Syndrome and was only diagnosed at the age of 25. I found it fascinating (and illuminating) that he can explain why he walked looking down, or stopped walking for no reason, or suddenly put his hands over his ears, and the like. Things we see children do all the time. It all made sense to me. Not only is Daniel extraordinary with numbers, he's also able to learn a language in a week. He has an obsessive need for order and routine. This, I get. Conclusion - I loved his articulate way of telling it like it is. This is such an eye-opener of a book and I feel priviledged to have read it. It gives you a whole new perspective of "other" people.